Ever been to Korea? Korea isn’t really on top of the list for Indian tourists, but why not explore a new country? I have Korea on my radar but most of my 2018 long weekends, leave availability are sold out, so I will be considering this destination in 2019. 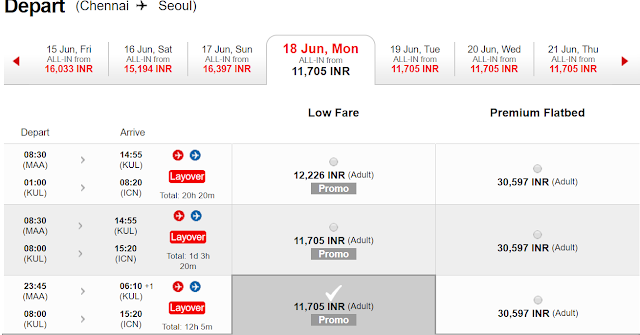 Meanwhile if you’re interested in visiting Korea, you can now do it for about 23000 INR round trip per person, thanks to Air Asia sale. This fare is for ex-Chennai. Use the website to check rates for your city and date. You can use monthly calendar to identify which date is cheapest. Book now for travel till June 30, 2018 for some discounted fares to various destinations on Air Asia. Is this the best fare you’ve seen? No. Cheapest I’ve seen is INR 19000 round trip-Chennai to Seoul and back. But you might have to wait for next big sale to get such low fares. 23k is decent in my opinion, if you’re looking to travel within next 6 months. Should you fly in and out of ICN (Seoul)? How much time is needed to explore Korea? South Korea is a big country, try to spend 2-3 weeks if possible. 7-10 days minimum in my opinion. What else I should keen in mind? Above fare doesn’t include food and baggage. South Korea is not a country frequented by Indians, do proper research to make the most of your trip and avoid mistakes. Is there a risk of War? Can’t comment how situation turns out over time. Everyone understands war is not in anyone’s interest, but you will never know. Seoul is within artillery range of North Korea but rest of South Korea are reasonably safe. One should be able to evacuate promptly if there’re signs of war breaking out. Yes, prior visa is needed. You can process via VFS, standard procedures.